This is a dessert that I made when I made donuts for the eggless bakers group.After cutting the donuts we were left with the center of the donut...a mini bite.I dipped these in chocolate ganache and chopped some fruit, threaded them in a satay stick and served with custard as a dip. My grand children loved these satay sticks and would quickly finish the fruit and wait for the donut. I just loved watching their expressions.The custard was a little thick but the kids had a after they finished eating those fruits and donuts.How they wished there was no fruit and only donuts!I took a small bite to taste, and loved the combo.Well if you do not have these mini donuts you could use only fruits, but the kids would want something chocolatey. Right ? So perhaps a cube of chocolate cake or a brownie too would taste awesome. There is no recipe to this one, you have to choose fruits of your choice. I used green apple, red apple, mango, tinned cherries. This is a simple dessert which can also be served for parties. You must remember to add some lemon juice to the fruits so that they do not discolor. 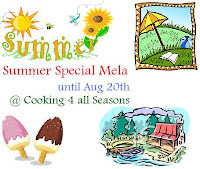 This goes for weekend cooking where Valli and Champa join me every Monday and also for Valli's summer mela.